After a rather calm December, snow is officially on the ground here in the Midwest and that means one thing and one thing only…WINTER IS OFFICIALLY HERE. With temperatures skating around 25 to 30 degrees and snow consistently falling, we have layering on the brain. There’s no doubt about it, layering without bulk can definitely be challenging for your winter stuff. Essentially, you are trying to achieve three goals: 1. Stay Warm, 2. Look Chic and most importantly, 3. Accentuate Shape. 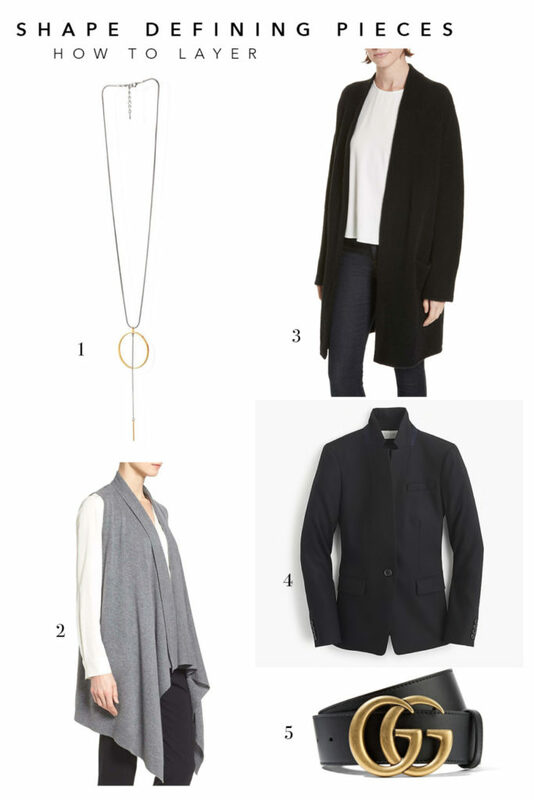 When it comes to layering without adding extra bulk, it’s a delicate and artful dance of BALANCE. You may remember THIS blog from last year, where we shared some of our favorite ways to layer. To take things a step further, today we are providing you with some essential tips and tricks that will enable you to artfully master layering your winter clothing without adding bulk. While this may sound simple, it’s important that you have the basics. Having the right arsenal of basics/underpinnings will give you the proper layering foundation. When considering your basics, think of thin layers! Layering on thinly is a two-fold job, it allows you to layer on more pieces, keeping things flush to the body and it also keeps you warmer than just throwing on a bunch of bulky layers. Rather than opting for cotton only, look for basic pieces that have lycra, elastane or tinsel. These materials contribute to giving you shape and creating a thin initial layer. Oh, and yes, be sure to keep your white woven at the front of your wardrobe during the colder temperatures! This powerhouse piece should definitely be considered a basic for you. 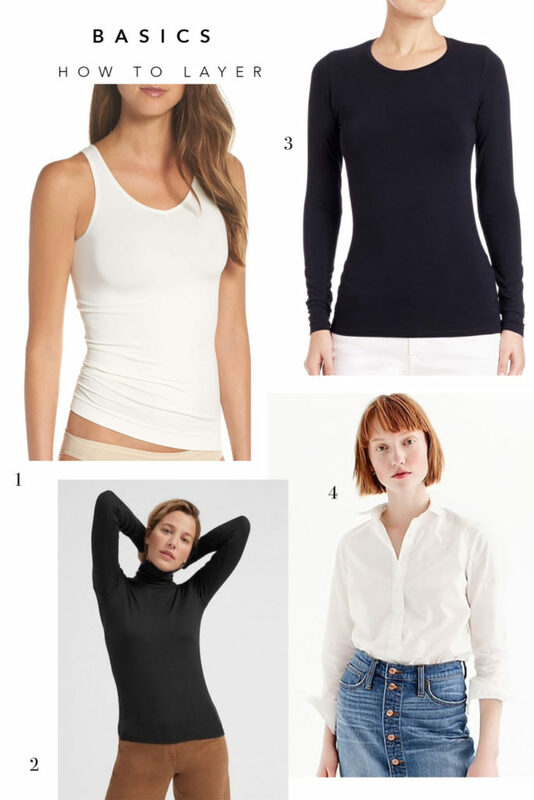 It’s great to layer on after putting on your cami or mock neck to then be followed by a chunky sweater or dress. 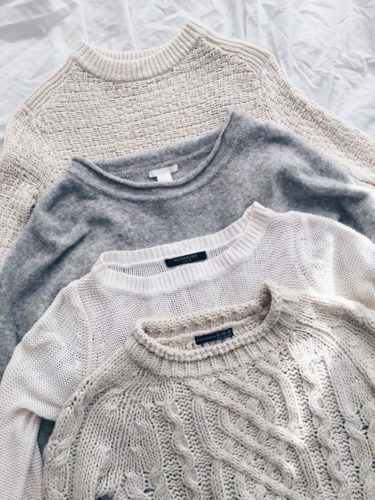 What’s not to love about fine knits! Think brushed wool, cashmere and/or silk blends. Layering these types of fabrics help you to achieve a flush layered look, while also keeping you amazingly warm. One of the alluring things about winter style is being able to wear more oversized and chunky clothing, which we LOVE. However, it’s important that even in exploring this fun winter fashion trend we keep shape at the forefront of our minds. Ensuring that your layered look best defines your shape will help mitigate looking bulky! Mixing and matching textures is always a good idea and especially during those winter months! When thinking about your winter layering strategy, we highly encourage exploring texture and especially for the lower half of the body. 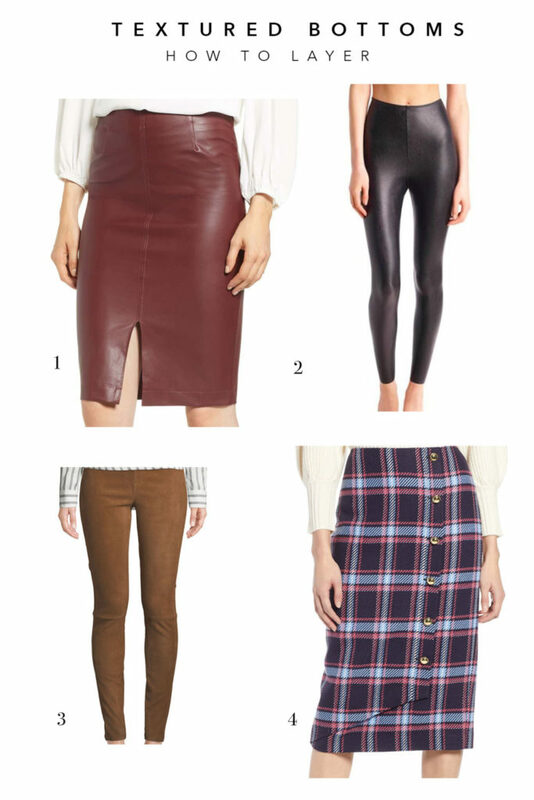 Swap your jeans for (faux) leather or suede leggings/pants. Not only can these textiles be warmer, but they also help create a slimming and balancing effect to your layered look. 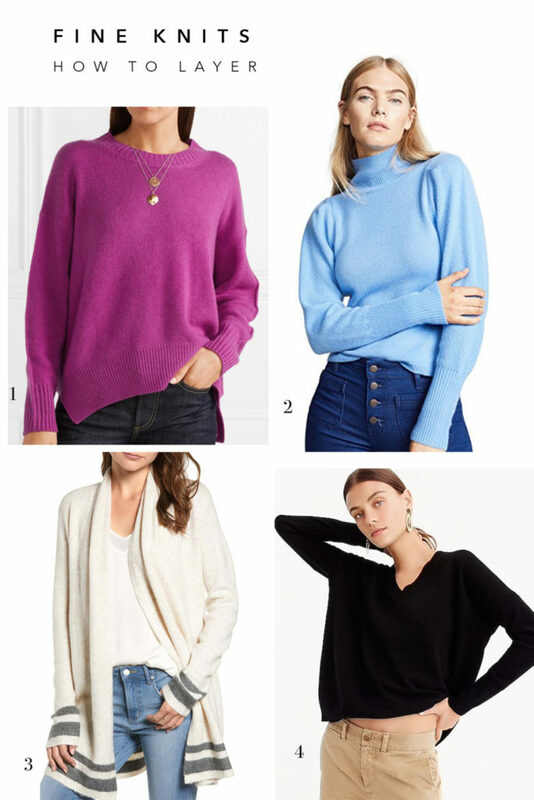 This tip can be particularly helpful when you desire to wear more of those oversized chunky sweaters or tunic-like sweaters. Other notable textures you can explore are corduroy, velvet or wax coated denim. For our dress loving gals, reach for all those tweed and leather textured dresses/skirts you have! Incorporating a black opaque tight is forever classic, but you can explore with lightly texturized tights for a bit of flare. Or perhaps warm is truly your mission, look for a legging with a bit more substance that has the look of a tight, but is giving you all the warmth! Just a few tips on how to layer without adding bulk!